If you do not like to use your spa outside in the winter, then fall is the time of year to properly close it. The main reason for winterizing a spa is to stop any water from freezing inside the spa shell, the pipes or the equipment - and causing serious damage by cracking your unit (water expands when it freezes). The Winter Spa Cover is the same cover they use to cover above ground pools in the winter. 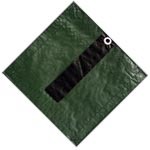 It is made of a Strong, Waterproof, Lightweight tarp material and is even large enough to cover the wood cabinet of most portable spas. No water can get through them. They come with a cable and winch to tighten it around the bottom of the spa cabinet. 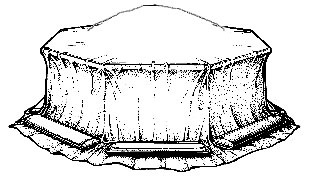 On inground or in deck spas, the cover is secured with water tubes (not included), like an inground swimming pool. 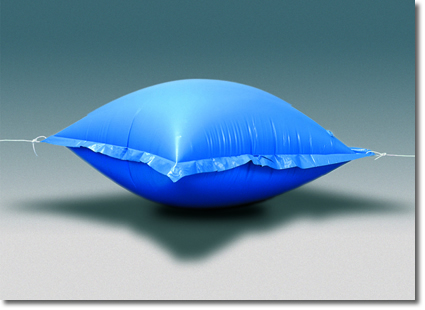 An air pillow is installed between the "hard" cover and the Winter Cover to allow rain water to easily drain off the cover, instead of accumulating - and possibly cracking your "hard" cover. Remember, spending a small amount of money up front can avoid costly damage come Springtime! Why spend hundreds of dollars on custom shaped "Spa Winter Covers" that only cover your Hard thermal cover and not the complete spa cabinet as well, when this method is very inexpensive, will last much longer and provide much more protection for your spa? Deluxe Winter Spa Cover protects spa cabinet, Spa cover and acrylic spa shell ! Keep your spa safe and secure through harsh winter weather with a Winter Spa Cover. Cover is big enough to accommodate any shaped spa up to 8' x 8' covering the top and side panels for total winter protection. If your tub is larger than 8', give us a call, we can get you a larger cover. Sorry, This item cannot be shipped Internationally. Click here to get to the "How To Close A Hot Tub Spa" instruction page.